Here's an idea for an IBM centennial prank: Swap one of those newer ThinkPads on display at Best Buy—say the ThinkPad L520—with the original model, the seminal IBM ThinkPad 700c. See how long it takes customers to notice. Although the insides have been upgraded many times over since the ThinkPad 700c's debut in 1992, the design—that squared-off black clamshell with a red TrackPoint pearl in the middle of the keyboard—has largely remained the same. It's nuts, really. Just try to think of another nearly two-decade old device that has gone through dozens of iterations without requiring much of a style upgrade. Everything from its color to its navigation tool to its size moved the game forward so much that it still remains true to its style origins. It all started like this: In the late ‘80s, IBM was hungry for a game changer. Tom Hardy, IBM's head of corporate design, was hoping to create a mobile machine known for style (gasp) as well as substance. He thought that people might actually want to enjoy looking at the thing they were spending more and more of their lives with. To that end, Hardy hired veteran design innovator Richard Sapper as a consultant. Sapper had gotten his start in the 1950s working on industrial design for Daimler-Benz, before going on to design pre-mobile industry flip phones for Siemens. Though Sapper cared about fashion, he was only interested in it if there was longevity baked into the design. And like the little black dress that never goes out of style, Sapper conceived of the ThinkPad as a sleek black box. The inspiration was the Japanese bento box-the stream lined black-lacquered container that carries some well thought out insides (aka lunch). The ThinkPad 700c would do the same, but instead of foodstuffs, it would carry the stuff businesses needed: Windows, Excel, Minesweeper. It was also designed to blend in with its surroundings. It had the same footprint as an 8.5 x 11 sheet of paper-the right dimensions for a brief case, and reminiscent of something you could slip in a file folder. A perfectly-sized midnight-colored rectangle may not sound like much in a sea of white, silver, and black gadgets out today, but computers just weren't clad in anything other than off-white at the time. One reason was that German regulations prohibited the use of any other color for fear that it would cause workers' eyes too much strain. But Hardy didn't care. He wanted the slickest entrance into the mobile computing industry possible, so he gave orders to ignore Europe's puritan color-regulations. Black was a go. "IBM Germany went berserk," Hardy told PC Magazine in 2007. (Subsequently, the disclaimer "Not for Office Use" was slapped on to all German-sold models.) Obviously, the decision was a good one. But bigger than its dark exterior was the red pearl inside. The brightly-colored dot nestled between "G," "H," and "B" in the keyboard offered a better way of navigating-one with more accuracy than the peripherals offered elsewhere. The idea was developed by IBM Research, but not initially for laptops. When the ThinkPad design team got wind of the prototype for desktops-at the time just a nail hammered into the center of a keyboard-they decided it would be better integrated into their portable computer. Tests used an eraser pulled from a No. 2 pencil to simulate the feel of what would become the TrackPoint. The point allowed users to swing over the screen with a single button. But then, again: a problem with the color. "[Sapper] wanted to call attention to the integrated pointing device by making it a red highlight," explains David Hill, Lenovo's VP of design, who moved with the line of PCs when it was sold by IBM. But at the time, IBM had a strict rule against having anything red on their products. "There was concern that people would think it was the emergency power off switch," says Hill. Facing a huge amount of IBM bureaucracy, Tom Hardy came up with a workaround. Instead of calling the TrackPoint "red" (its clear color), Hardy branded the hue "magenta," expertly navigating the internal tape of the same imagined color. The two buttons at the bottom of the keyboard were also stripped red, in order to tie them to the navigation tool. When Lenovo bought IBM's PC division in 2005, the ThinkPad team moved over with the deal. "There's always a discussion about what we're going to do next. We always want to improve our products, but there was never a meeting where we'd think, ‘We're Lenovo now, what is this going to look like?'" says Hill. "ThinkPad is unique because it's a brand as well as a design." In October 2010, the 60 millionth ThinkPad was sold. The line claims the title of the first color screen on a laptop, first modern laptop in space, first laptop with a built-in DVD-ROM-etc. etc. MoMA's permanent collection even includes a model from the line. 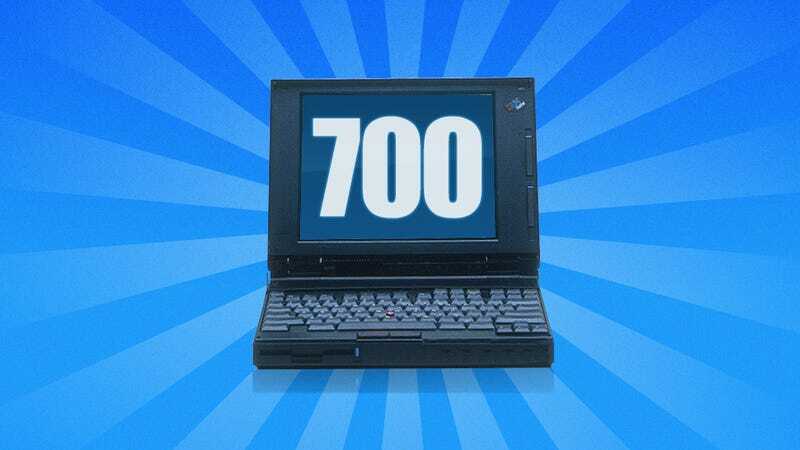 And kicking it all off was the 700c, the first laptop with an operating system that really worked in a package that people would actually want to carry. Rachel Swaby is a freelance writer living in San Francisco. Catch up with her on Twitter.